Catch up on all of our news! 2016 – Hot Springs, Arkansas – The Oaklawn Foundation presented Project HOPE Food Bank a grant in the amount of $14,762 to purchase a 4,000 pound material lift and pallet shelves. The grant will complete the food bank’s expansion project started in 2015. The funding is crucial for program efficiency and will provide the added storage to warehouse pallets of food. This is important because of the increase in food distributions over the last few years. In the first six months of 2016 alone, the food bank has distributed 460,000 pounds of food compared to the 354,000 pounds distributed during the same period in 2015. The benefits of this grant will impact the community through alleviating hunger for many years to come. To keep up with the growing demand for food in our community, Project HOPE Food Bank must work with extreme efficiency. Arkansas is ranked highest in the nation for the number of seniors struggling with food insecurity, according to the National Foundation to End Senior Hunger. Approximately 1 in 4 seniors (24.85%) face a constant battle with hunger, 9% over the national average. The number of Arkansas’s families struggling with food insecurity is estimated to be 19.1% second only to Mississippi. for Medical Sciences and the Donald W. Reynolds Foundation. The Oaklawn Senior Health Care Center (OSHCC) was established in 2009 as the eighth Center on Aging in the Arkansas Aging Initiative. OSHCC is the fulfillment of a promise made in 2005 by the family of Charles Cella, the third-generation owner of Oaklawn Park Race Track. Project HOPE Food Bank is a volunteer based operation, including our Director, Ted Thompson and Inventory Specialist, Charles Hood. We have 25 individuals to assist the food bank with daily operations and host over 400 volunteers throughout the year. Our warehouse space is donated and all of our equipment has been obtained through grants. This unique infrastructure allows the food bank to make a substantial impact on those in our community struggling with food insecurity. Your tax deductible donations are greatly appreciated and 96% of every dollar donated goes directly to alleviate hunger. Children living in poverty often rely on the school breakfast/lunch program for the majority of their nutrition. This grant will provide food to sustain children during weekends and holidays. Closing the nutritional gaps assists children in maintaining better health and empowers better emotional and physical growth. The Blue & You Foundation’s partnership with the food bank will touch the lives of so many children in our community. Arkansas Blue Cross and Blue Shield established the Blue & You Foundation in 2001 as a charitable foundation to promote better health in Arkansas. The Blue & You Foundation awards grants annually to non-profit or governmental organizations and programs that positively affect the health of Arkansans. In its 14 years of operation, the Blue & You Foundation has awarded more than $24 million to 766 health improvement programs in Arkansas. “Our grants this year went to programs across the state that address such issues as nutrition and exercise, dental health, and medical professional education,” said Patrick O’Sullivan, executive director of the Blue & You Foundation. Project HOPE Food Bank, at the request of local schools established a Backpack Assistance program in 2015. The program has grown to providing food for children in three Arkansas counties and has had requests from schools in two more counties. The food bank relies on individuals, business and foundations to provide funding to reach out to those in need. In 2015, Project HOPE Food Bank OPHhhdistributed 802,000 pounds of food to our 55 partnering agencies. Agencies included: Children’s homes and feeding programs, homeless shelters, charity kitchens along with faith based and community pantries. Distribution in 2015 increased 20% from the previous year. To implement the program the food bank purchases nutritious food products through local and national distributers. We partner grants and donations to subsidize over fifty percent of wholesale food price. The food bank then partners with churches, individuals, organizations and other non-profits to provide the remaining funds for the backpacks. Some schools have backpack partners while other schools are in desperate need of partners. We have the opportunity to offer these children the same chances for success as their well-fed counterparts. 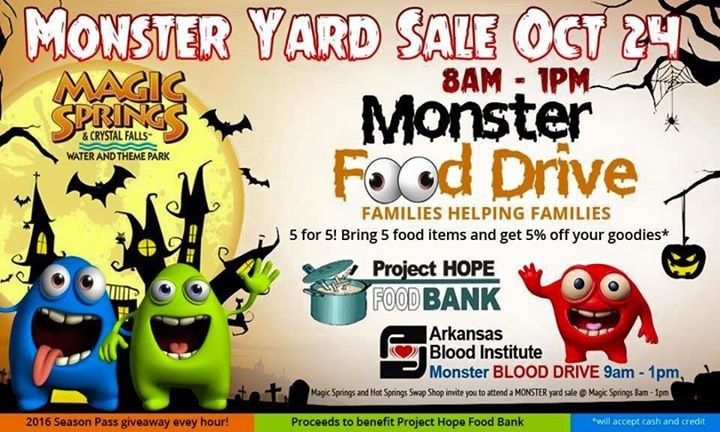 If you are interested in partnering with the Project HOPE Food Bank, to provide nutrition over the weekends for children in need, please feel free to contact us at 501/623-3663 or come by 915b Gaines Ave., Hot Springs, AR. The council consists of a diverse group of Garland County High School students who have an interest in giving back to the community. The committee studies the needs of Garland county children and youth and award grants to non-profit agencies focused on serving these groups. Since 2001, they have awarded over $100,000 to improve the lives of young people. This year, they awarded $15,300 to 10 agencies such as Project Hope Food Bank. YAC members meet once a month with adult advisors to learn the art of responsible grant making. YAC empowers these youth with an early opportunity for philanthropy with a focus on providing grants in the future. During the award ceremony members of the council members spoke of their future educational pursuits. The YAC youth are truly an inspiration and provide hope for the future. The $1,000.00 grant presented to Project HOPE Food Bank will benefit the School Backpack program. The food bank thus far in 2016 has distributed over 40,000 pounds of food to area schools. The food is distributed to school children on Friday to help sustain their nutritional needs over the weekend. Many children in our community struggle with food insecurity when they do not have access to school meals. Each backpack consists of nutritional food that is readily consumable or easily prepared, yet light enough for young children to carry along with school books. YAC support for this program will help provide meals to children in our community struggling with food insecurity. Hot Springs, Arkansas, September 9, 2015 – Project Hope Food Bank today received a $27,000 contribution to assist with providing weekly food boxes to seniors across Southwest Arkansas. The grant – which was given to the non-profit organization through the Walmart Foundation’s State Giving Program – will work to identify seniors in need and provide them with food boxes that provide the seniors with everything they need to eat for a week. The grant was presented to Project Hope Food Bank during a check presentation ceremony held at 2 p.m. today at the Food Bank in Hot Springs. During the ceremony, which was attended by board chairman State Representative John Vines, attendees learned more about the senior meal program that provide a week’s worth of nutritious food for seniors facing food insecurity challenges. Project HOPE Food Bank will work in conjunction with several of the local agencies providing senior services for the distribution on the boxes. Through this partnership the identified senior receives food along with much-needed contact with a caring individual. The donation will be used in the food subsidy program the hosted by Project HOPE Food Bank. This program reaches the largest number of people in need in our community. Currently the subsidy program has distributed 755,000 pounds of food to local agencies that serve those in need. These 45 agencies include children’s homes and feeding programs, homeless shelters, soup kitchens, crisis centers, and community and faith based pantries. The food collected will be used to stretch the budgets of our programs that focus on people in food crisis. The emergency food box program focuses on families struggling with food insecurity. The families are identified through area schools, community counseling centers, cancer centers and our local charitable clinics. The foods will also be used in our Emergency Senior Food Box program. This program assists local seniors facing hunger. Arkansas currently ranks first in the nation for the number of seniors struggling with food insecurity. It is estimated over 240,000 Arkansans over the age of 60 are food insecure - nearly 40% of Arkansas seniors. The foods will be included in the food boxes and distributed through agencies that serve seniors in need.